Christmas is the time of year to tell everyone you love them, even those that don’t have a voice to reciprocate the sentiment. Our furry four-legged friends deserve to be included in the gift giving season, so get them their own personalized pet Christmas stocking this year from GiftsForYouNow. Let’s face it: we definitely spoil dogs more than other animals. So wanting to give them their own Christmas stocking is no surprise. Of course we have traditional designs souped up for your favorite furry friend - like red with a personalized bone embroidering along with a great designs! 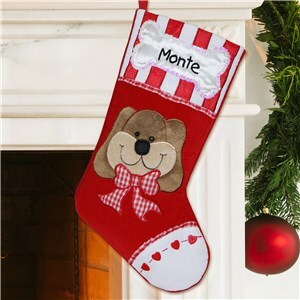 If you are looking for something a little more eccentric, the dog photo stocking or dog breed stocking both would give these special stockings a unique finish. If you have other types of animals you’re shopping for, GiftsForYouNow has a nice selection of holiday stockings for the diverse pets in our lives. 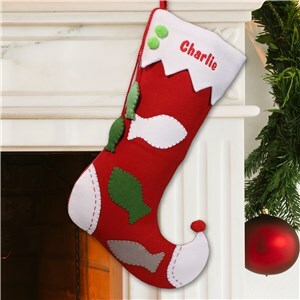 An embroidered cat Christmas stocking or a personalized fish Christmas stocking are both good options to choose from when you want to show off how much you love your whole family. 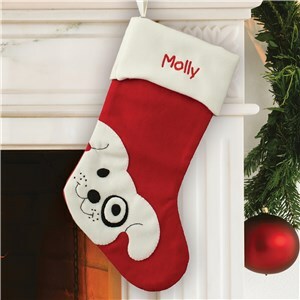 A stocking for your pet makes sure everyone sees them as part of the family, just make sure to put it on the mantle to keep it out of reach to be chewed on! Very pleased with this pillow. Giving it as a Christmas gift to my son, and I’m sure it will be a treasure! Put the “Furbabies” (Dogs) names on it since I am patiently waiting for grandbabies lol. Outfit your family pet with Personalized Pet Gifts from GiftsForYouNow. We offer so many gifts & keepsakes to choose from. Whether you like to show off your pet with apparel, picture frames, photos or more, you'll find exactly what you need at GiftsForYouNow.